Forum: Beam Optics Design, Beam Collimation, Final Doublet. At the KEK Workshop, WG4 decided to develop a complete Beam Delivery System including 2 IRs, one with a 20-mrad crossing angle (to be evaluated in range 12-25 mrad) and one with a 2-mrad crossing angle (to be evaluated in region 2-7 mrad). At SLAC Yuri Nosochkov is working on the 20-mrad extraction line design, which includes separate energy and polarimetry chicanes (see http://www.slac.stanford.edu/xorg/lcd/ipbi/monthlymeetings/0 8dec2004/20mrad_extline_diagnostics.jpg). Next, Yuri will work on 2-mrad extraction line, initially with no beam diagnostics. (If this is successful with acceptable beam losses, will later look into adding E,P diagnostics). Upstream BDS for 2-mrad needs to include E,P measurements. For a strawman design, I propose we use the 4-magnet chicane described by Ray Arnold on slide 6 of his Nov. IPBI presentation (see http://www.slac.stanford.edu/xorg/lcd/ipbi/monthlymeetings/0 3nov2004/Chicane_Issues.pdf This energy chicane needs to go downstream of the energy collimation. For polarimetry Ken Moffeit and I propose as a strawman to duplicate roughly (larger separation between middle 2 magnets) the energy chicane design for a polarimeter chicane, but locate upstream of the energy collimation (see http://www.slac.stanford.edu/xorg/lcd/ipbi/monthlymeetings/0 8dec2004/Pol_Chicane_Upstream.jpg). Also, want beam trajectory at middle of polarimeter chicane parallel to IP (though chicane also allows possibility for using the chicane to match the trajectory). Upstream BDS for 20-mrad. Would prefer this to include similar energy and polarimeter chicanes as the 2-mrad BDS. But this is lower priority in SLAC studies and will be investigated later. A simple but powerful software tool for detector design studies, aimed at investigating the resolution of fitted track parameters in the vertex region for the purpose of comparing and optimizing the track sensitive devices and the material budgets of various detector set-ups. This is achieved by a mini simulation of the set-up (rotational symmetric w.r.t. the beam axis, homogeneous magnetic field), followed by a full track reconstruction. The package is written in MatLab. A pre-release, covering only "barrel region" tracks, is available from Meinhard. Preliminary documentation can be downloaded from http://wwwhephy.oeaw.ac.at/p3w/ilc/reports/LiC_Det_Toy/UserG uide.pdf. Recent addition is a simple interface to the VERTIGO DataSeeder for vertex reconstruction by the RAVE toolkit. An official release, including also the "forward/backward region", is due by autumn this year. cd lelaps # change to the lelaps directory inside lelaps! A new version of LCDG4, v04-00, has been released. Please visit http://nicadd.niu.edu/cgi-bin/cvsweb.cgi/lcdg4/VERSION for release notes and corresponding versions. Documentation is available at http://nicadd.niu.edu/lcdg4 . Enjoy, and please let us know if you find any problems, or have any questions. nicadd server (access instructions below). at lima at fnal dot gov. UA1 VXD experience: I talked to Tom Markiewicz who recalls that the initial beam pipe was too thin to have enough skin depths for the higher beam rf harmonics; some possible contacts on this: Kate Morgan (friend of Nan and I'll ask Nan how to contact), Guryn at Brookhaven, Ann Kiernan (retired?). Also may be documented in a NIM paper? theory talk on calculating HOMs: Perry Wilson? rf shield included in NLC ZDR in "pant-leg" region of the crossing angle geometry? need to check for additional notes/documentation on VXD3 EMI problem: Vavra? Mentioned in any of the UK theses on VXD? experiment. I'm not an expert on this, but I'll summarize my current understanding of the SLD experience. This will be summarized better by Marty Breidenbach at the MDI Workshop. At SLD, it took ~200 ms to read out the VXD, longer than the 8 ms between bunches (120 Hz operation). was observed only for VXD3 detector and not for VXD2. VXD2 was used thru 1995 and VXD3 was used in 1996-1998. 3. Bunch lengths at different colliders: SLC (1mm), LEP (10mm), PEP-II (12mm), KEK-B (7mm), HERA e+ (8mm), ILC (0.3mm). paper or note relevant for LC Higgs physics. for Higgs physics studies can be posted. at the International Linear Collider Workshop (LCWS04). in order to get the information sorted a bit. in order to make the best out of our limited resources. Will there be discussion of photon beam dump considerations for the 2-mrad IR at the MDI Workshop? 10-meter long photon beam dump. Can SLAC's Conventional Facilities and Beam Dump Engineering experts consider this to provide comments at the MDI Workshop? from NLC ZDR Chapter 11.A on "The Beam Dumps", see http://www.slac.stanford.edu/accel/nlc/zdr/Snowmass96/ZDRCH1 1.PDF . This presents common beam dump for beam and beamsstrahlung, for 16 MW/beam. Beam dump volume includes 1.5-meter diameter and 6-meter length water dump. At SLAC Yuri Nosochkov is working on the 20-mrad extraction line design, which includes separate energy and polarimetry chicanes (see sketch). Next, Yuri will work on 2-mrad extraction line, initially with no beam diagnostics. (Later we can worry about adding diagnostics). Upstream BDS for 2-mrad needs to include E,P measurements. 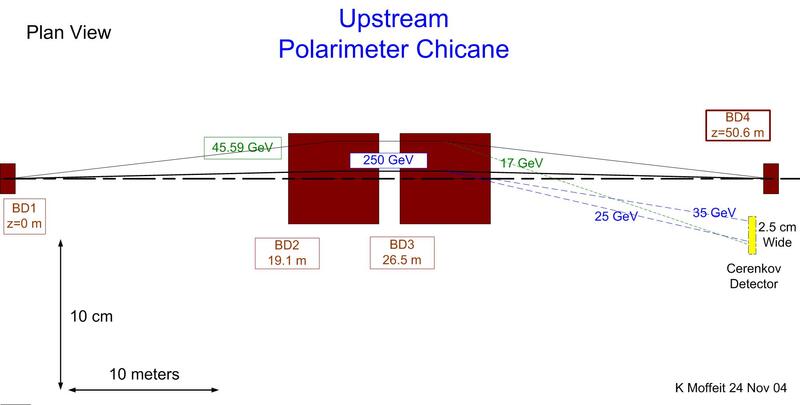 For a strawman design, I propose we use the 4-magnet chicane described by Ray Arnold on slide 6 of his Nov. IPBI presentation, This energy chicane needs to go downstream of the energy collimation. For polarimetry Ken Moffeit and I propose as a strawman to duplicate roughly (larger separation between middle 2 magnets) the energy chicane design for a polarimeter chicane, but locate upstream of the energy collimation (see sketch). Also, want beam trajectory at middle of polarimeter chicane parallel to IP (though chicane also allows possibility for using the chicane to match the trajectory). Upstream BDS for 20-mrad. Would prefer this to include similar energy and polarimeter chicanes as the 2-mrad BDS. But this is lower priority and can come later. Attached here you have some notes concerning the Simulation Meeting held on 26 April 2004 at the L.L.R. The Worldwide LC Simulation Working Group is preparing a document that lists the requirements for a common detector simulation program. A preliminary draft of this document is attached. We'll post updates on this forum, but you can find the latest version also at http://nicadd.niu.edu/~dhiman/lcd/software/simulation/simreq doc.pdf. We intend to finalize the document over this summer. Your comments, suggestions, and questions, as a potential developer or user, are most welcome. This is only the first step, to be followed by analysis, design, and implementation of many components that must be realized concurrently. As you can see, tasks are many, developers few, and time rather limited. Please let us know if you'd like to join the development team.